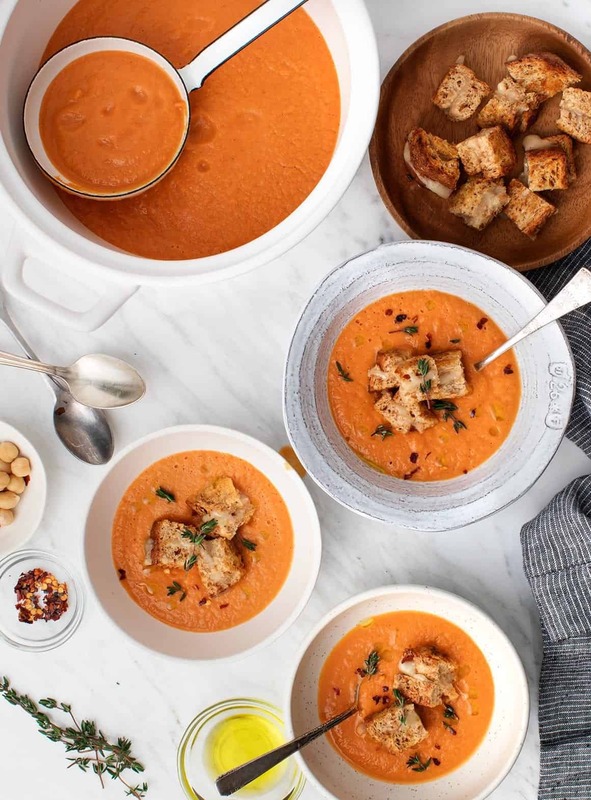 Vegan tomato soup + grilled cheese croutons = the ultimate winter comfort food. This soup has no nuts or dairy: it's creamy from blended chickpeas! During my first semester in college, I gained about 25 pounds. For a short person who never had any issues with food or weight, it was dramatic. It was the result of terrible cafeteria food, too many fat-free animal crackers, and definitely too many midnight dorm room pizzas. That New Year’s Eve, I resolved to get the weight off… and fast. My best friend told me that she was doing this thing called the master cleanse so, naturally, that sounded like a good idea. I’m sure you’ve heard of it – it involves a concoction made of lemon juice, maple syrup, and black pepper. Only I didn’t like black pepper and maple syrup was expensive, so instead I decided that I would just drink lemon juice mixed with water for as many days as were directed in the “cleanse.” During those first few weeks back at school, while everyone would have their cafeteria trays full of pancakes and whatever other breakfast food, I’d fill my tray with four glasses of water, sit down, and start squeezing my lemons. Everyone thought I was crazy, but the idea of just eating reasonably and sensibly didn’t make sense to my college self, who wanted to be thin NOW. Well, I was crazy, and drinking only lemon juice isn’t actually sustainable (no love with those lemons), but this line of thinking stayed with me for a couple of years while I yoyo’d up and down in weight. That was until one day I learned that if I just ate pretty well and avoided crazy ups and downs, everything would be ok – and it has been. So this year, like every year, I have no New Year’s diet resolutions other than continuing to eat delicious, wholesome food with some room for fun foods. 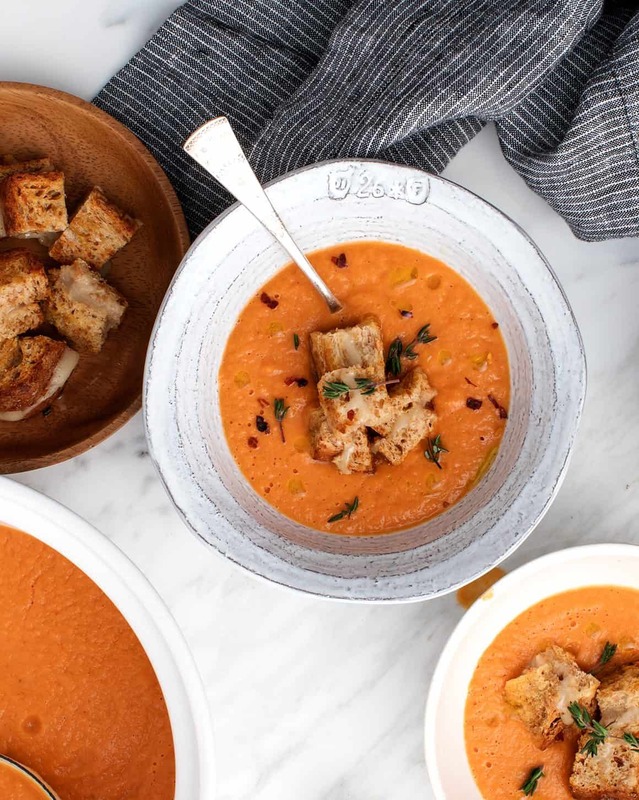 Just like this vegan tomato soup (wholesome) with grilled cheese croutons (fun!). It’s all vegan, but I promise you won’t know it because this soup is so creamy even though there is no actual cream. 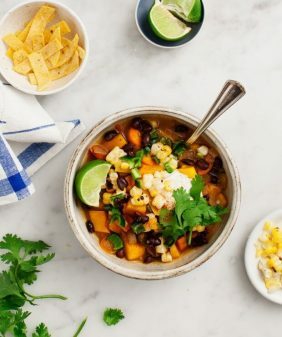 We’re partnering with ALDI on this post because they carry delicious organic produce and some A+ pantry staples as well. 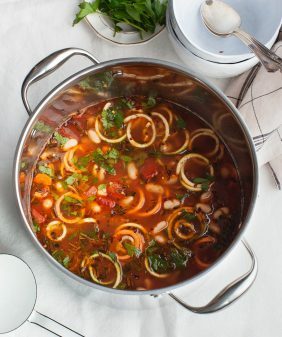 Because it’s winter, I intended to make this soup using only canned tomatoes, but when we got to ALDI, their organic fresh tomatoes just looked so darn good. So I roasted onions, tomatoes, and garlic, which I later blended with canned tomatoes, chickpeas, olive oil, balsamic vinegar, and fresh thyme to make this vegan tomato soup. This vegan tomato soup is SO good. 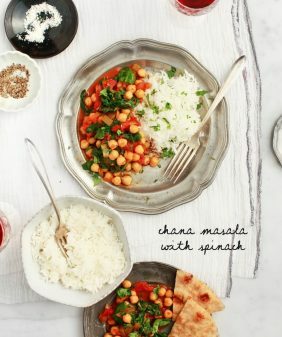 It’s tangy from the tomatoes, creamy from the chickpeas, and so so satisfying. 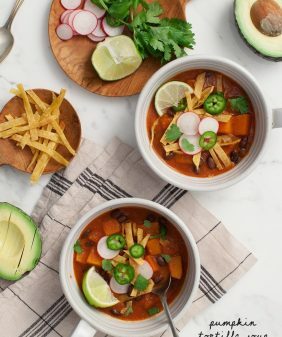 I’d say yes to a bowl of this soup every day of the winter. Jack, who is not the biggest fan of tomato soup, could not get enough. The vegan tomato soup is delicious on its own, but the fun, yummy grilled cheese croutons really take it over the top. I used ALDI’s Knock Your Sprouts Off Sprouted 7 Grain Bread and their Earth Grown Vegan Shredded Cheese. I have to tell you that I’m so excited about this vegan cheese because: 1 – it tastes really good, 2 – it actually melts great, and 3 – it’s so affordable! Happy New Year’s soup making! For more of my favorite soup recipes, check out the SOUP section of our recipe index. Preheat the oven to 450° F and line a baking sheet with parchment paper. Wrap the garlic cloves in a piece of foil and place it on the baking sheet along with the whole tomatoes and the onion wedges. Drizzle with olive oil and a pinch of salt and pepper and roast for 20 to 25 minutes, or until the tomatoes and onions are well browned. Peel the garlic and transfer the roasted vegetables to a blender. Reduce the oven heat to 400° F and line the baking sheet with a fresh sheet of parchment paper. Make the croutons: Sprinkle 4 slices of the sprouted bread with the vegan shredded cheese (don't pile too high in the middle or the croutons will be too melty to slice). Top with the remaining bread slices to make sandwiches and drizzle the outsides of the bread with olive oil. Bake until the cheese is melted and the bread is golden brown, about 8 minutes. Let cool completely before slicing into croutons so that the cheese doesn’t ooze out when you cut it. 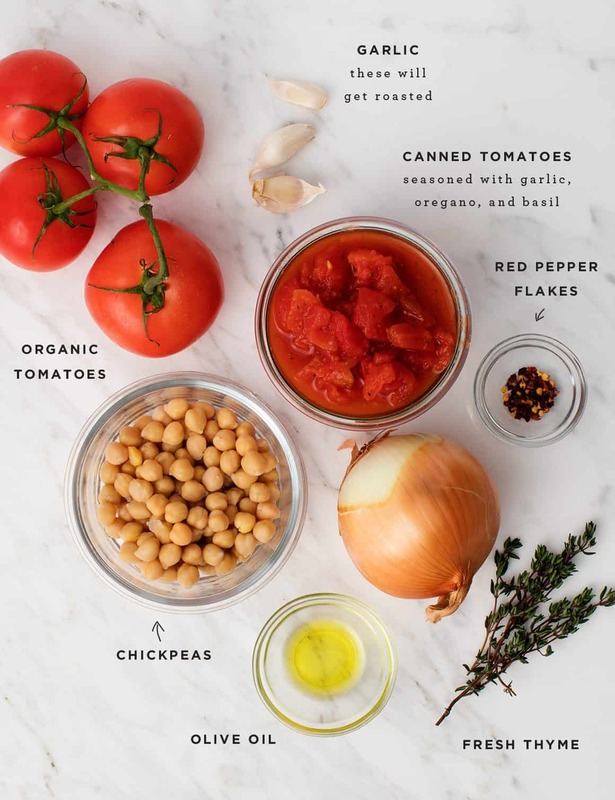 To the blender, add the canned tomatoes, garbanzo beans, balsamic vinegar, maple syrup, thyme leaves, 1 tablespoon olive oil, red pepper flakes, ½ teaspoon sea salt, and freshly ground pepper and blend until creamy (a Vitamix is ideal here. If using a regular blender, just blend longer!). Taste and adjust seasonings as desired. At this stage, the soup should still be hot. If not, pour it into a pot to reheat it. Serve the soup with the croutons (some in the soup, some on the side) and additional fresh thyme, red pepper flakes, and chickpeas, if desired. note: This soup serves 4 if you serve each bowl with 1 sandwich worth of grilled cheese croutons (as written). If you make the soup without these substantial croutons, it makes 3-4 smaller side-dish servings. Serve with a salad or double the recipe to serve more. Make this recipe gluten-free by using gluten free bread. Special thanks to ALDI for partnering on this post. Click here to find a store near you! I see my old self in your description of your college self 🙂 Funny what we can live through, eh? Thanks for the super recipe! I look forward to trying it out! If you have room in your freezer, you can freeze quartered roma-type tomatoes from the summer glut. I grow my own, but you can get them from a local farmers market when in season. I used to can them but it is a million times easier (and less hot) to just freeze them in bags. I then use them all winter long for chili, sauce, soups – anything that calls for canned tomatoes, I throw them in. The best part, when defrosting, the skins will come right off. I am fine with the skins (think they add more tomato flavor) but to your taste. How would you adapt this to using canned tomatoes? Should they still be roasted in the oven? Step 2 says to reduce the oven temperature to 400oF, but I can’t seem to see what the original temperature was when roasting the veggies in step 1. What am I missing? Thanks for another delicious recipe. thanks for clarifying 🙂 Going to make some right now. Omgosh this looks amazing!! And VEGAN cheese at Aldi 😱😱😱 #runstoaldirightaway I hope my local Aldi carries it!! I think all of the stores just started carrying it this January – we really like it, I hope you do too! GRILLED CHEESE CROUTONS?!?! This recipe is pure genius! Excited to cook this this week – have been looking for a tomato soup for awhile that had complex flavor but not a boatload of heavy cream (could’ve tried coconut milk but for some reason tomato soup with coconut milk felt wrong to me – I’m sure I’m off base about that since I love a curry…) and I bet the chickpeas are perfect, plus making it an actual meal with staying power. Looking forward to this. The grilled cheese as crotons is genius! Yummy..looks delicious! I’ll try this recipe..thanks for sharing! Soooooh creamy and delicious on a rainy day – or any day! Didn’t have chickpeas to hand, which is unusual, so tried a couple of handfuls of cous cous instead. A bit wary putting it in blender, as don’t like to mess around with recipes too much. Seemed to work just as well. Your soups are just the best around. Thank You! I just happen to come to your blog from pinterest. your images and recipes are so amazing, that I couldn’t help but write a comment. You are doing an amazing job. You just inspired me to cook more! I am definitely going to try this recipe! Do you think a food processer will work here? 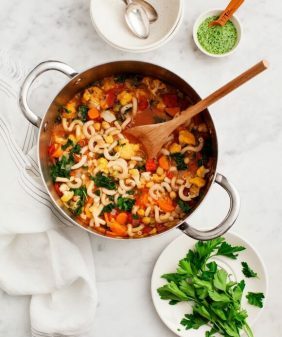 it’ll be a chunky soup vs. a creamy soup – I bet it will still be delicious even though the texture will be pretty different. Hope that helps! Thanks. I don’t have a VitaMix and was afraid my blender wouldn’t be able to handle it but it was fine in my blender. The soup was amazing! Who knew…chickpeas. I’ve got all these things in my kitchen…no fresh tomatoes…so canned will have to do the trick. How quick and easy and I’m sure will be full of flavor. Since I’m trying to pump the brakes on my bread addiction I think I’ll add some pepitas to the top for a bit of crunch. Thanks for the post! This recipe looks great. This year, I have been in such a Soup mood. I have yet to find a homemade tomato soup recipe that I want to make over and and over again. I’m hoping this will be that recipe! I have a question about blending. How would you adapt the recipe if you used an immersion blender rather than blending the soup in a vitamix or other free standing blender? I prefer thick soups so I do not mind if it does not come out completely smooth like in the pictures. I appreciate any insight you may have! yum! 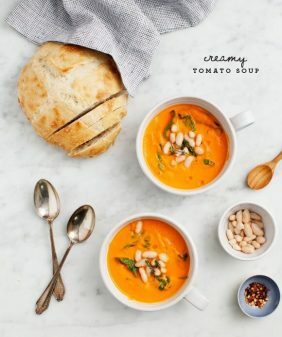 i love tomato soup but i don’t think i’ve seen a recipe that throws chickpeas in the mix. i’ll definitely have to try it! If I don’t have any fresh tomatoes, could I still make it? Maybe add some more canned tomatoes? absolutely delicious! We will definitely be making this soup again!!!! This recipe was amazing and came out delicious! I’m in my late 20s and always have been scared to cook by myself. Last week I saw this recipe and since tomato soup is my favorite, I got the courage to get these very few ingredients and put it together. It came out great and I feel so accomplished. Thank YOU! Hi!! Would an immersion blender work here?